Bradford City boss David Hopkin felt his side paid the price for ‘15 minutes of madness’ during their 4-0 defeat at Luton last night. Midway through the first half, the visitors were level at 0-0 as their containing job on Town was paying off, clear-cut chances not readily available. It was 15 minutes of madness that’s cost us. However, James Justin then netted from close range on 28 minutes and by the interval, Luton out of sight, leading 3-0. Speaking afterwards, Hopkin said: “They had a lot of possession but I don’t think they hurt us. “Then we showed someone inside again for a shot, Richard (O’Donnell) spilled it, and it’s a tap-in for 1-0. “Their third goal was just schoolboy stuff. I thought the three goals were really poor. Hopkin was left contesting Town’s second goal as well, with the Bantams boss believing his side should have been awarded a free kick against home stopper James Shea. Visiting custodian O’Donnell was booked in the aftermath for complaining to referee Anthony Coggins, as Hopkin continued: “That’s why I was going at the fourth official. “Their keeper went to throw it out, drops it and picks the ball back up as Eoin Doyle goes to get it. “Anybody that knows football knows it’s a free-kick for us. The Bantams did improve in the second period, with David Ball seeing his header ruled out for offside, while Jack Payne had a number of efforts, with Shea saving from Kelvin Mellor as well. 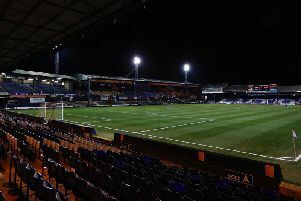 Hatters did go on to add a fourth late on through Harry Cornick, as Hopkin added: “I told the players at half-time to go for it for the fans who’ve travelled down. “We just need to take it on the chin, I’d just like to thank the fans who travelled down here tonight, I thought they stayed in their numbers and they stayed behind, appreciated the players effort they put in the second half. “I thought they got in Luton’s faces a bit more second half and pushed the game up.